The Chinese ZTE has announced one more smartphone after presenting the V7 Max smartphone two days ago. The new smartphone is called Blade A910 and features a metallic chassis that is 6.9 mm thick, which is the first nice feature the device comes with. 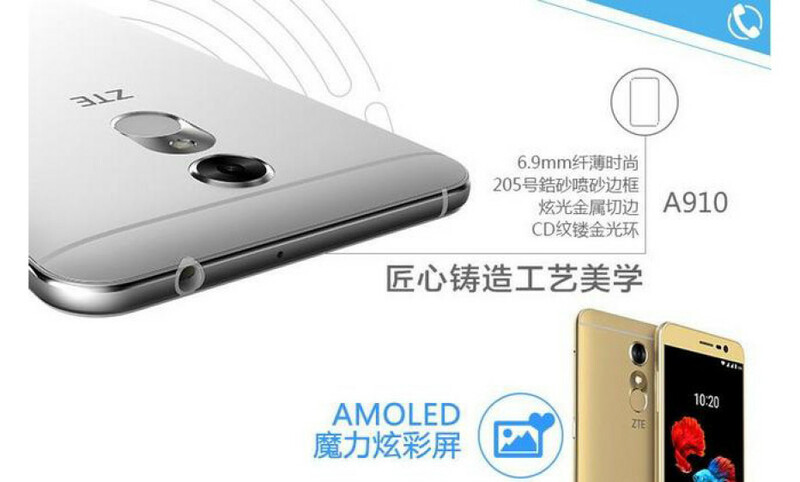 In addition to this the Blade A910 comes with an AMOLED display that is 5.5 inches in size. The display works at 1280 x 720 pixels. Next to this the Blade A910 offers a MediaTek MT6735 processor, 2 or 3 GB of RAM and 16 GB or 32 GB of internal memory (depending on the version chosen), a microSD slot for expansion (up to 128 GB) and two cameras – a rear one at 13 MP and a front one at 8 MP. All this hardware is powered by a 2450 mAh battery which supports quick charging. The Blade A910 sells for USD 200 for the version with 2 GB RAM and 16 GB memory and USD 230 for the model with 3 GB RAM and 32 GB of memory.